In the February issue of Library Worklife we mentioned the fact that once every few years the dates for National Library Workers Day (NLWD) and Equal Pay Day coincide with one another. This is one of those years. Both will be held on April 10, 2018. We are encouraging individuals, groups, and libraries to celebrate both days together. Library organizations are encouraged to host celebrations and submit names of stars to honor great workers, teams or departments by visiting the NLWD website. 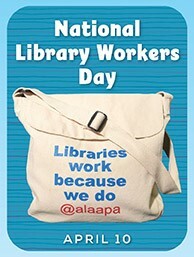 Consider purchasing an official NLWD poster, satchels or t-shirts for your staff from the ALA Store. In addition, library workers are asked to wear red on April 10, 2018 to symbolize how far women and minorities are “in the red” with their pay. As a female dominated profession (over 85%) pay equity is an issue that affects all library workers regardless of gender. For more details on both days, see the February issue of Library Worklife.